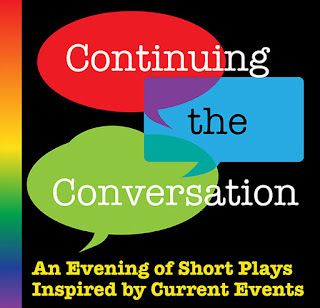 Dreamcatcher Repertory Theatre, professional theatre in residence at Oakes Center in Summit, is producing the World Premiere of Continuing the Conversation: An Evening of Short Plays Inspired by Current Events. The plays, by writers Suzanne Bradbeer, Richard Dresser, Steve Harper, Dania Ramos, Lia Romeo and David Lee White, all deal with themes that are in the public consciousness right now. Dreamcatcher has taken what was a one-night event last season and given it a place on the mainstage this spring. Continuing the Conversation runs April 26 - May 13, 2018. Continuing the Conversation is focused on the interaction between the stories we tell in the theatre and the lives we are living. It's a chance to connect artists and audiences in an immediate way, with several discussions following the performances throughout the run. This spring’s plays span topics such as sexual harassment, media fatigue, Hurricane Maria’s devastation of Puerto Rico, confederate icons, the violence in Charlottesville and the decision to run for elected office. These subjects, while ripped from the headlines, are seen through a personal lens with warmth, sensitivity and even humor. The plays are directed by Laura Ekstrand (Livingston), Jessica O’Hara-Baker (New York City) and Harriett Trangucci (Summit), and feature Dreamcatcher ensemble member Noreen Farley (Clinton) as well as guests Michael Aquino (Bloomfield), Gary-Kayi Fletcher (Scotch Plains), Ben Kaufman (New York City), Beth Painter (Westfield), Amanda Salazar (New York City) and Daria Sullivan (Montclair). Several performances will be followed by discussions with guest speakers on topics derived from the plays. Continuing the Conversation will run at Dreamcatcher from Thursday, April 26, a preview performance, through Sunday, May 13, 2018. Performances are Friday and Saturday nights at 8pm, and Sundays at 2pm. Tickets range from $20 to $35, with special rates for subscribers and groups. Purchase tickets at www.dreamcatcherrep.org or by calling Brown Paper Tickets at 800-838-3006. Special dates: Thursday, April 26 is a preview performance; all tickets $20. Friday, April 27 is opening night, followed by a reception with the cast. Sunday, April 29 is Senior Sunday; seniors age 65+ pay $20. Talkbacks follow the April 29 and May 6 matinees, with more to be announced. Performances are at Oakes Center, located at 120 Morris Avenue in Summit. Parking is available in the lot behind the theatre at 20 Ashwood Avenue and at the Summit Recreation Center, 100 Morris Avenue. The facility is wheelchair accessible. Assistive listening devices for the hearing impaired and advance large print scripts are available for free by prior arrangement. To purchase tickets or for information on any of Dreamcatcher Repertory Theatre's programs, visit www.dreamcatcherrep.org or contact Dreamcatcher Repertory Theatre at Oakes Center, 120 Morris Avenue, Summit, NJ 07901, business phone 908-514-9654.